Canon has announced an upgrade to two of its most popular and renowned L-series lenses: the EF 70-200mm f/4L IS II USM and EF 70-200mm f/2.8L IS III USM. "The EF 70-200mm f/4L IS II USM epitomises the very finest in L-series optical technology, with impressive 5-stop Image Stabilisation in a compact, robust and lightweight design; and the EF 70-200mm f/2.8L IS III USM offers unbeatable performance, versatility and durability to meet the demands of professional photographers,” said Brendan Maher, product Manager, Canon Australia. 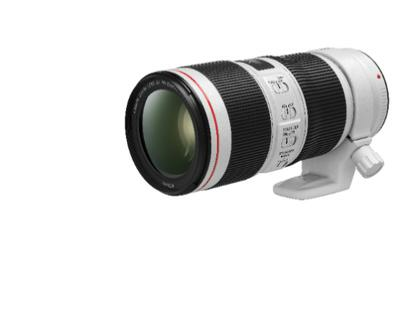 Built on the high standards of its predecessor, the EF 70-200mm f/4L IS II USM possesses a superior build, durability, and ergonomic design that Canon’s broad lens range is renowned for. Fluorine coating reduces dirt and water drops clinging to the lens, and Super Spectra coatings eliminate ghosting and flare. The upgraded EF 70-200mm f/4L IS II USM also incorporates a new Image Stabiliser unit which delivers the equivalent effect of a shutter five-stops faster, compared to the previous lens's three-stops. Meanwhile, the new EF 70-200mm f/2.8L IS III USM has been designed with high-performance and robustness in mind. Canon say it's ideal for a photographer who requires a high-quality telephoto lens for accurate detail and that the lenses' protective seals make it an obvious choice for challenging conditions. The new EF 70-200mm f/2.8L IS III USM also includes Air Sphere Coating, an anti-reflective technology developed by Canon to minimise reflections and flare.